Little is known about the life of 19th century suffragist Sarah F. Norton beyond her writings. She was a public speaker, writer for feminist publications, and member of the Working Women’s Association who advocated for the education of women and girls and equal opportunity in the workplace and equal pay for women. After speeches by [Anthony] and myself, the house became noisy, at her suggestion, for a speech from Mr. Cornell. With inimitable grace he walked to the platform and turning so as to command a view of both the audience and ourselves as much as possible, said: “…I would say in reply to Mrs. Norton’s expressed wish to enter the University, that if she does not enter it, it will be her own fault.” …Mr. Cornell assured us that women are to be admitted… how far his personal influence or wishes will avail against the power [of the trustees and directors], remains to be proved…. A year later, in 1870, Cornell became one of the first universities in the United States to admit women. But equal education and employment opportunities were not Norton’s only concerns. 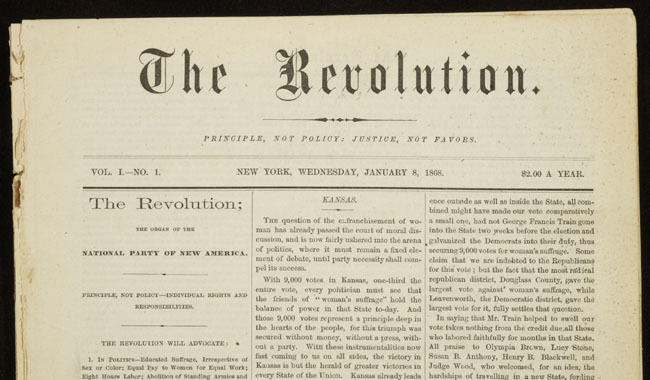 In another feminist newspaper, Woodhull & Claflin’s Weekly, Sarah Norton harshly decried the “Tragedy — Social and Domestic” of infanticide and “the fast increasing crime of fœticide,” or abortion. [C]hild-murder is an easy and every-day affair…. [C]hild murderers practice their profession without let or hinderance, and open infant butcheries unquestioned, establishing themselves with an impunity that is not allowed to the slaughterers of cattle…. Scores of persons advertise their willingness to commit this form of murder, and with unblushing effrontery announce their names and residences in the daily papers. No one seems to be shocked by the fact…. [C]irculars are distributed broadcast, recommending certain pills and potions for the very purpose, and by these means the names of these slayers of infants, and the methods by which they practice their life-destroying trade, have become “familiar in our mouths as household words.” …Is there no remedy for all this ante-natal child murder? …Perhaps there will come a time when… an unmarried mother will not be despised because of her motherhood… and when the right of the unborn to be born will not be denied or interfered with. Norton was particularly concerned that double-standards regarding the sexes should be eliminated, and that men should be held responsible for the “instigating” role they so often played. Feminists for Life is proud to share our rich, pro-life feminist history with the next generation of pro-woman, pro-life leaders. We invite women and men from various perspectives to participate in creating solutions that meet the needs of pregnant women and parents in the workplace, on college campuses, and at home.